1. A Chartered Psychologist; BPS and HPC registered. Many clients are at low ebb when they attend. Psychometric measures need to be interpreted by properly trained and qualified professionals. The service often identifies personal development and counselling needs in addition to study or career matches. For example, many of my clients are perfectionists who may never be happy until they learn the concept ‘good enough’. Many clients are sent by private hospitals following stress, control or addiction-related illness. Many have special educational needs (Asperger’s Syndrome, deafness, ADHD, Dyslexia, Dyspraxia, etc.) Having initially trained as an Educational Psychologist, I am unfazed by disabilities (I work with Help for Heroes advising ex-service personnel). Then again, some clients may actually have a relationship issue impacting their sense of wellbeing rather than a career one! I only see one client per day, so I do not have to rush because there is someone else waiting in the wings to be seen. I can give my full time and attention to you all day. I write a bespoke report, so there is no computer generated narrative. We start the afternoon counselling session with just the test profiles as tools and talking points. The thorough assessment (motivation, ability and personal qualities), and the in-depth, personal counselling and dialogue ensure total buy-in and instil the direction and confidence you need to feel empowered to act. Clients feel reassured through seeing graphs with results so clearly displayed in front of them. I may not tell you anything that you do not already know about yourself (after all, you are the one who has told me about yourself through the questionnaires), but I should confirm your thinking. I add value by interpreting and then matching results to potential careers and exploring the implications of what has emerged. Through working from home and as a self-employed freelancer (I am charged out for significantly more by other agencies), I have vastly reduced overheads and can pass savings on to you (especially given that there is no additional VAT as a health professional). Fees include lunch and a two year contact or mentoring period, during which you might contact me for academic references, further tips and advice (rarely required) at no further cost. I am a recognised career change expert often put forward by the BPS press department and quoted in media and broadsheets(try ‘googling’ my name). 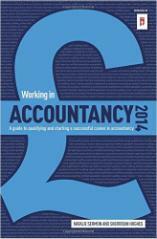 I co-wrote a guide to Working in Accountancy 2014, providing valuable tips on the profession and how to gain entry.